Another terrorist was arrested and questioned on suspicion of involvement in the terror attack at the Rami Levy supermarket. 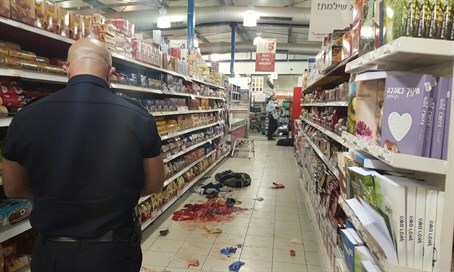 Authorities have declared that another terrorist took part in the stabbing attack that occurred on Thursday at the Rami Levy supermarket in Sha'ar Binyamin. This terrorist was arrested and interrogated by the Israeli Security Agency (ISA or Sin Bet) for participating in a terror attack along with the two 14-years-old terrorists from Bitunia, who were shot and neutralized by armed civilians. The attack claimed the life of 21-year-old Tuvia Yanai Weissman and moderately wounded 36-year-old Avi Avital. As of Sunday morning, stationary metal detectors had been set up at the Sha’ar Binyamin store while police are expected to force Levy to set up additional security guards, stationary as well as hand-held metal detectors, and additional security cameras where needed.